After three years and 262 posts of “The Converting Curmudgeon” Blog here on WordPress and on the CONVERTING QUARTERLY Website, all new future posts will appear exclusively on the CQ site. Feel free to peruse past posts for a wealth of information on converting, packaging and printing, but in addition to all that data (and more actually) go to www.convertingquarterly.com/blogs/converting-curmudgeon.aspx Bookmark the link, sign up for the RSS feed. In this my final installment on the HP Indigo Worldwide VIP event held last week in Israel, here’s an update primarily on developments in wide-web digital printing for flexible packaging. 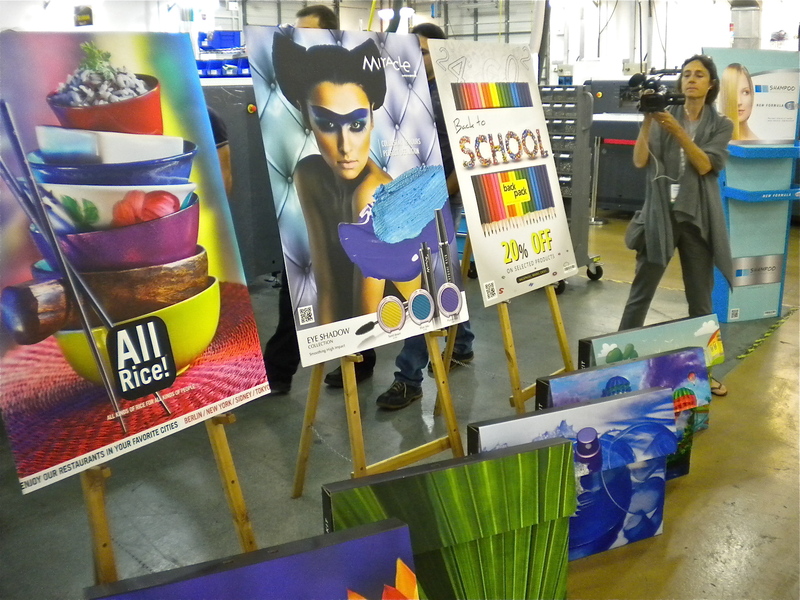 Output from the HP Indigo 20000 digital press during a live demo at the company’s Ness Ziona facility. Transforming the packaged-goods industry today are three major trends – theme-based packaging, micro-segmentation of product lines, and SKU proliferation, says Francois Martin, worldwide marketing director for HP’s Graphics Solutions Business. For example, between 2007 and 2012, retailers carried an additional 10,000 SKUs – now about 48,000 for the average grocery store. These trends, in turn, have forced brand owners (and their converter suppliers) to require shorter runs of many more package versions, a reduced supply chain with less waste and storage costs, and distributed package printing near their product manufacturing sites — all aspects that wide-web digital printing helps answer. When it comes to flexible packaging, HP estimates a total addressable market for digital printing of these materials at $200 million (with a 31% CAGR) from 2012-2020. This equates to about 2 billion units. HP Indigo 20000 print engines being assembled at the Kiryat Gat press and ink manufacturing plant. 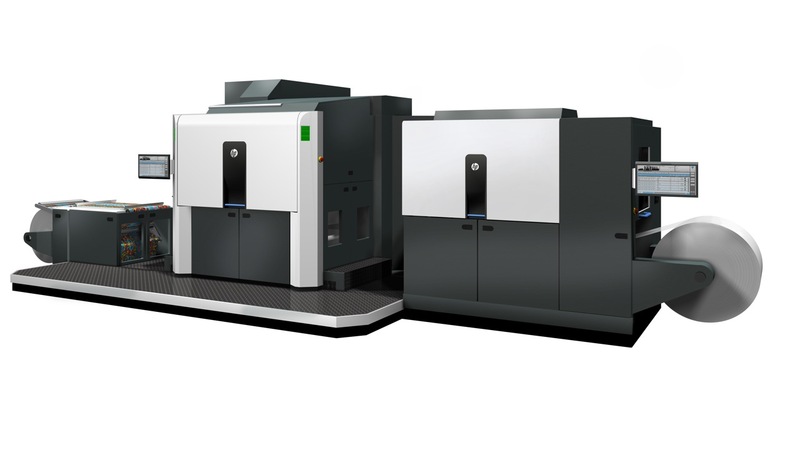 HP Indigo’s solution is the 20000 Digital Press, launched earlier this year (top photo). So far, 10 of the largest flex-pack converters in the world have purchased a system, and the first installations are planned for the end of 2013, the company says. 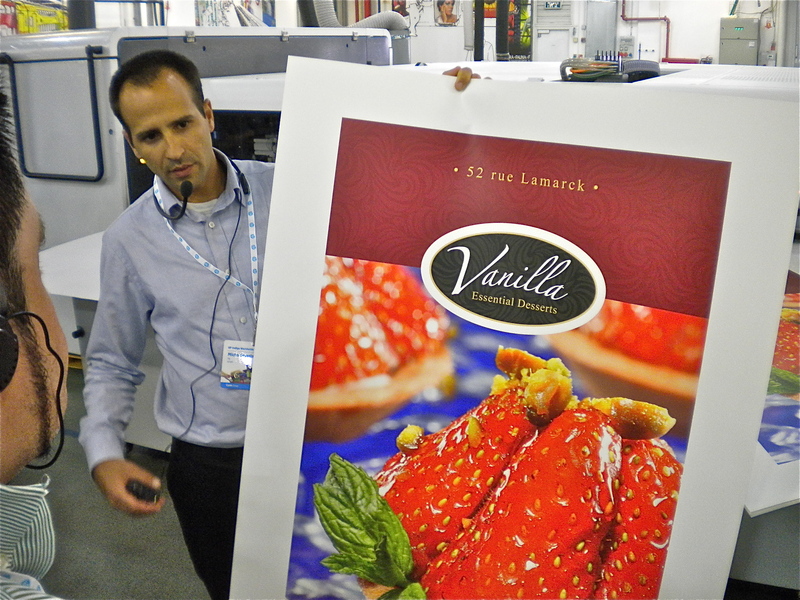 We witnessed a live press demo at the HP Indigo offices in Ness Ziona. Some specs: The roll-fed HP Indigo 20000 runs a 30-in.-wide (29-in.-wide image format) web with up to a 44-in. repeat. It supports 90% of all applications by printing on film, paper, aluminum and biodegradable substrates as thin as 10 microns and as thick as 250 microns. Off-the-shelf material printing is made possible by an integrated coating station, which includes an unwinder, corona treater, priming unit and dryer. Standard CMYK is augmented by adding opaque white, as well as by optional 6- and 7-color printing. Speeds of 112 fpm in 4-color, and 147 fpm in an Enhanced Productivity Mode are offered. Five-color printing cuts that down to 88 fpm. Partner vendor AB Graphics’ digicon 3000 finishing system will be integrated in-line with the HP Indigo 20000 digital press, allowing one-pass production of labels and a variety of flexible-packaging laminates. That equipment provides unwind, substrate pretreatment (if necessary), drying, a flexo/gravure printing or adhesive application station, solvent or water-based lamination, diecutting, slitting and rewinding. The digicon 3000 will be shown at Labelexpo Europe in Brussels (Beligum) this September. My Thoughts: It’s been eight years since I was last at an HP Indigo event in Israel, and I was truly impressed with how far the technology has come. Compared to the breakthrough Omnius, introduced back in 1995, throughput is now six times faster on a web 2.5 times wider. 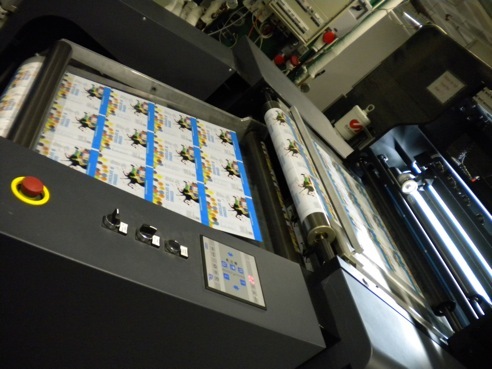 Will digital printing eventually approach the sheer productivity of flexo or gravure? Possibly, but that’s not the point, really. 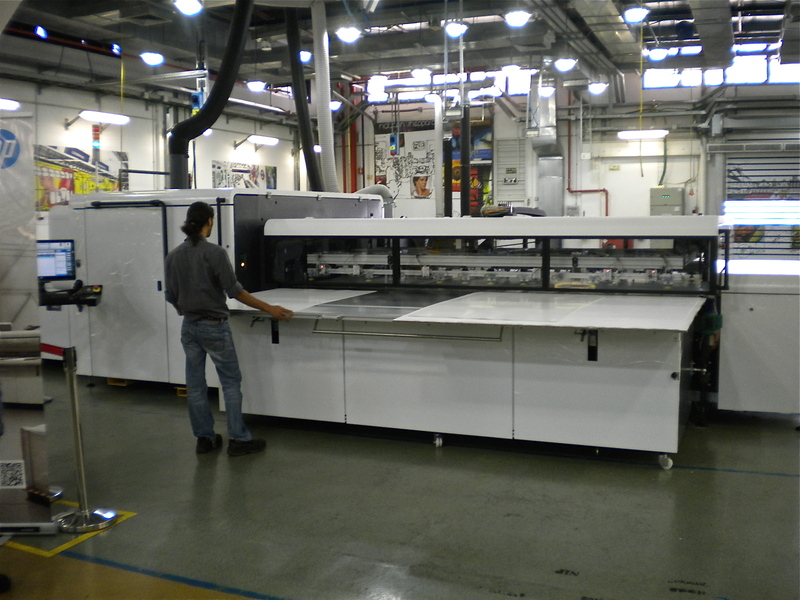 A 2,000-fpm CI-flexo press fits the need for churning out a warehouseful per day of the same printed packaging; a 150-fpm digital press that can make every impression unique fits the shorter-run direction that a growing part of the industry (and its customers) is headed toward. HP Indigo is going partly to the pull-through method of promotion. As vp-gm Alon Bar-Shany explains, they are looking at Labelexpo Europe as a “packaging show,” not just a labeling show. They will bring brand owners to Brussels (as well as interpack 2014 next spring in Düsseldorf, Germany) to get them excited about the possibilities and realities of digital print. Still, he admits they want to create a preference for HP Indigo, not just digital. From last week’s sneak peek at new hardware, software and consumables presented during the HP Indigo Worldwide VIP Event in Israel, I came away with the idea that the HP Scitex division of HP is clearly ushering in a new generation of high-impact graphics for corrugated-packaging applications. While large-format, inkjet-printed corrugated packaging makes up only 1% of the market today (litho-laminated offset is about 60%; flexo makes up the balance), HP Scitex sees it rapidly growing in the next few years. The total addressable market for inkjet corrugated will reach US$1.5 billion by 2020, climbing 50% a year, the supplier forecasts. High-margin applications (anything costing more than $1.00/sq meter) such as shelf-ready packaging, high-impact consumer packaging, and temporary and permanent retail displays will be prime market drivers. HP Scitex FB10000 Industrial Press: In development for the past three years, the large-format, flatbed inkjet printer turns out 625 m2/hr, or the equivalent of 1,000 B1 sheets in less than 2 hrs, including full loading and unloading cycles. Using new High Dynamic Range (HDR) printing technology with new HDR300 printheads (312 in total, 52 per color) (described below), it prints new HDR240 Scitex UV-curable inks in CMYK, light cyan and light magenta. The FB10000 is said to run flexible and rigid sheets of acrylic, foam PVC, PVC sheets, HIPS, fluted PP, PC, PE, PP, synthetic paper, paper, foamboard, compressed paperboard and corrugated. Optimized for corrugated, the press has auto-calibration tools, an automatic sheet feeder, requires no setup and will be upgradable down the road. With commercial availability expected Nov. 1, there are already two Beta sites (one in Europe, one in the US) testing the FB10000. HP Scitex exec Micha Kemelman shows off output from the FB10000 large-format, flatbed inkjet press. HP Scitex High Dynamic Range (HDR) printing tech: New on an industrial scale, HDR combines inkjet algorithmic, hardware and system elements to reportedly replace the need for offset or flexo printing apps, HP Scitex says. Dot sizes via HDR300 printheads are controlled dynamically. Halftone capabilities of stochastic screening are enhanced by modulating the density of each pixel among 16 gray levels. Compared to binary printing, HDR printing produces more directly-printable colors for fine color addressability within the gamut. This allows HP Scitex HDR printing to produce fine image detail with low image grain and smooth color and tone transitions with industrial productivity. Resolution typically ranges from 450 to 750 dpi. HDR printing tech’s ability to achieve near-offset-quality is its combination of 16-GL (gray-level) dots at 600 lpi in a 150-lpi cell. This results in 256 gray levels at 150 lpi. HP Scitex HDR300 printheads: This HP innovation has each nozzle producing drops at one of four available volumes—0, 15, 30 and 45 pl—at up to 24,000 drops/sec (24 kHz). The drops merge in-flight to produce a variable-sized dot, and this dynamic grayscale printing is done at full press speed, HP Scitex says. Four printable levels of each color (CMYK, light cyan and light magenta) are possible. Manufactured by HP in Corvallis, OR, HDR300 printheads each have 192 nozzles spaced at 150 nozzles/in. for a 32.5-mm (1.28-in.) print swath. HP HDR240 Scitex UV-curable inks: Specifically designed for HDR printing with HDR300 printheads, these inks have been tested on more than 40 media. They have ink coverage up to 15% higher than HP FB225 inks, enhance versatility by extending applications into more cost-sensitive jobs, and achieve cross-hatch level adhesion to plastics without the need for pretreatment. Elongation up to 300% gives HDR240 Scitex Inks greater flexibility to resist cracking for folding, cutting and creasing. For indoor POP displays, the cured inks deliver improved environmental performance with reduced odor and have achieved GREENGUARD GOLD Certification. Forty-seven percent of Pantone® colors are achievable, and about 1,500 sq ft of substrate can be printed with 1 liter of ink. My Thoughts: Output from the new HP Scitex FB10000 is truly impressive. The HDR printing tech appears to deliver what it says, “near-offset quality,” and the HDR240 inks don’t chip off the edges of cut corrugated or crack when folded—based on the samples we looked at during the press demo. But the real test of all these developments will be market adoption. Are corrugated-packaging converters ready to make the significant investment necessary to take on this technology? HP Scitex thinks so, especially in terms of companies adding digital capabilities to their established flexo or litho-lam ops. If your field is supplying CPCs with high-end, longer-term POP displays that must look good and stay that way to help sell higher-end products, then the $10/sq meter you’d get paid to rapidly produce 1,000 such containers may be worth it.